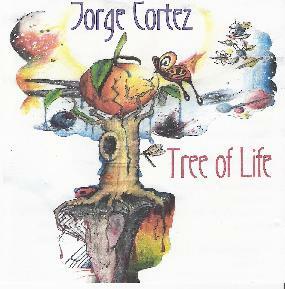 Jorge Cortez - "Tree of Life"
I don't know much about Jorge Cortez himself, but the music on Tree of Life is pure electronic music that will take you back to the wonderful analogue 70's. With it's punchy sequences and harsh, almost industrial sounds, Kraftwerk is an obvious influence on Cortez (though there are no vocals; it's all instrumental), but the weird, unearthly melodies, spacey electronic bubbles, and liquid textures hint at Jean Michel Jarre as well. Cortez layers multiple sequences, building on them slowly in each piece, increasing the tension by modulating and distorting the noise, then resolving it with more spacey pads and liquid gurgles. Don't get me wrong though. Although each piece is built around this very basic formula, Cortez works hard at creating unique sequences and sounds to make each piece its own little distinctive voyage. Here's one artist who is not afraid at all to experiment, but keeps the music moving and rhythmic in nature. A very pleasurable listen! For more information you can visit the Jorge Cortez web site at: http://www.losalgodones.com./jorge.